Not the whole bomber, mind you, but rather pieces of it. 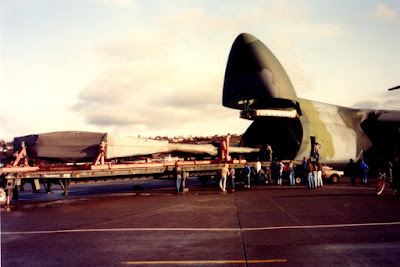 Big pieces, including the wings and the "cargo hold" otherwise known as the bomb bay structure were delivered for assembly by C-5 Galaxy airlift. But first, a little background on the B-2 is in order. 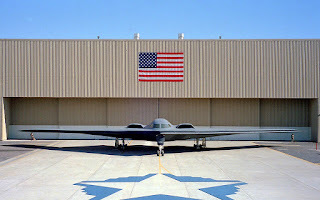 The B-2 Spirit, America's newest manned bomber was rolled out of the hangar at the Northrop facility at Plant 42 in Palmdale, California on November 22, 1988. Echoing the design of Jack Northrop's YB-49 flying wing, the B-2 features computer flight controls to maintain the stability lacking in the earlier design along with advanced stealth structures and coatings designed to evade enemy radars. As usual, the procurement program ended up being contentious. Starting with an initial planned buy of 132 aircraft, the number was later reduced to 75 aircraft, and after the collapse of the Soviet Union, further reduced to only 20 aircraft. A test aircraft retained by Northrop was eventually delivered to the Air Force as an operational bomber to bring the total to 21 airframes. Including spare parts and other support, the final cost was nearly a billion dollars per delivered bomber. Adding in development, facilities, and procurement costs resulted in an astounding final cost of over two billion dollars per aircraft. I am of course reminded of the Calvin Coolidge quote in regards to aircraft acquisition: "Why don't we buy just one airplane and let the pilots take turns flying it." He was more prescient than he knew. 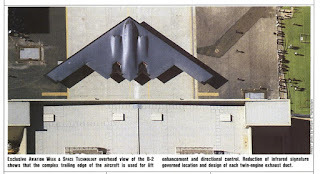 The B-2 was assembled by Northrop in Palmdale, Ca, as I mentioned above, but as with any large acquisition program, much of the work was actually farmed out to many subcontractors who manufactured major parts of the aircraft. One of these subcontractors was the Boeing Corporation which had responsibility for the outboard portion of the wing, the aft center fuselage section, landing gears, fuel system and weapons delivery system. This work was carried out at the Boeing Military Airplanes Company facility located at Boeing Field in Seattle, Wa. 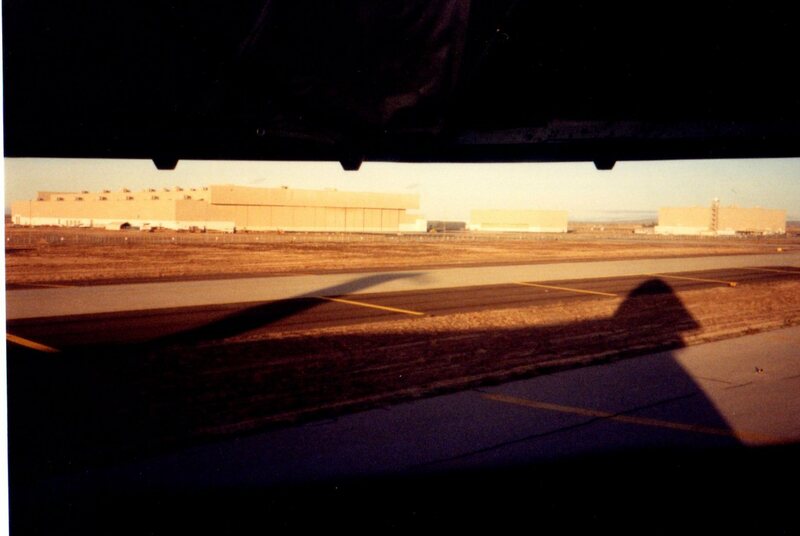 How these large aircraft structures got from Seattle to Palmdale is where your humble narrator comes in. Rather than ship them via rail, which was perhaps the most cost efficient method, they were shipped via C-5 Galaxy cargo aircraft. I don't know the reason for this, but it was probably due to secrecy and security considerations. I was assigned to the crew that flew one of these missions back in 1993. It encompassed two days flying from Travis AFB to Boeing Field for pickup, and then on to Palmdale for delivery before returning to Travis. We laid over in Seattle. One of the enlisted crewmembers on the trip was particularly resourceful and had arranged to get the entire crew a tour of both the Boeing facility and the Northrop assembly plant. This was no easy feat as the program, while not officially "black" (secret), still retained many of the security safeguards and procedures from the "black" days. This meant getting background clearance and customized ID badges. It turned out to be a real treat. The inside of the plant appeared as you might expect with lots of large machinery laying about along with many technicians moving here and there. Entrance from any section of the factory to another required a keycard swipe and code entry which for 1993 was new and exotic. Right away though, it was obvious that something different was being built here. 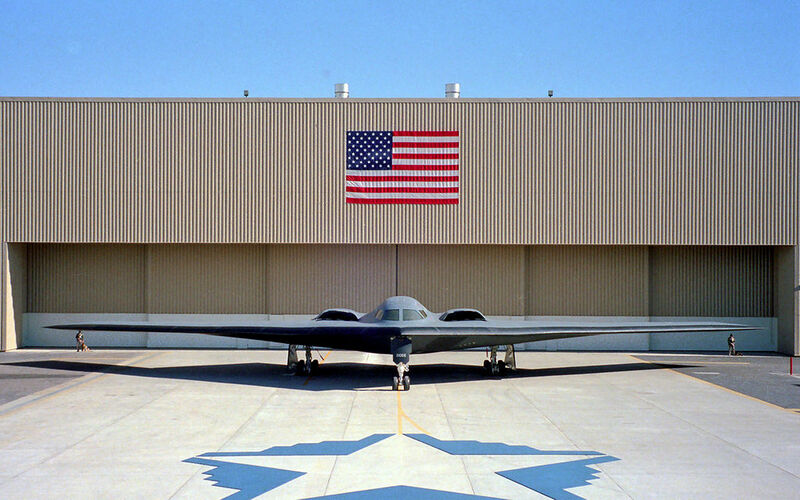 The wings of the B-2 are not made of aluminum, but rather are constructed of resin impregnated graphite fiber. This was a new material used in aircraft construction which was first used by Airbus in the A320. The difference for Boeing was that while Airbus still used aluminum for the main structure of the wings on the A320, the entire structure of the B-2 wing is constructed of composite material. And even though the technology involved in the manufacture of large composite structures is quite complex, I got the feeling I was watching a huge plastic model airplane being glued together. A huge jig which matched the shape of the wing was used to hold the cloth which was laid down by a computer controlled spool exactly where it was needed. Resin would then be applied, and the entire structure, which probably weighed several tons, was floated on air jets into a giant autoclave, which is a fancy word for oven. It was there that it would cook until the resin and cloth were bonded. This formed an upper or lower skin panel of the wing which was then attached to composite "stringers" or beams to make up the wing structure. As we walked around, I couldn't help but notice a somewhat similar jig to that of the B-2 wing. It turned out to be for the tail of the new 777 project then undergoing. Like the Airbus, Boeing designed the horizontal stabilizer (or tail) of their new airplane using composites as well. Also interesting was that our guide was extremely reticent to talk about it when asked. If you'll recall, back in that timeframe Boeing and Airbus were conducting a war of words over government subsidies to their respective industries. Boeing claimed that Airbus was able to undercut their pricing due to subsidies they received from their government owners, while Airbus countered that Boeing had similar advantages due to military contracts and technology transfers from military programs. It makes sense to put all your large composite manufacturing projects in one location to avoid unnecessary duplication, but no doubt our guide may have been concerned about the optics of such an arrangement or had instructions to not discuss the subject. In another part of the factory we then observed the wing being assembled. After the top and bottom skins had been attached to the stringers, workers would enter the wing structure to install wiring and plumbing. These workers were outfitted with oxygen masks and monitors to ensure that if they became incapacitated, they could be rescued quickly. Our guide explained that in years gone by, an incapacitated worker might have been extracted by actually cutting into the aluminum wing skin. That wasn't happening on the billion dollar bomber, hence the monitors. The next morning we were up early to preflight for our short flight from Seattle to Palmdale. As we got to the airplane, it was still being loaded with the B-2 wings which were tightly wrapped in tarps and attached to a travel framework. One of our contacts mentioned that in the "black" program days, the package would be augmented with extraneous pieces of styrofoam under the tarps to attempt to disguise the actual payload. The loading was also done at night. Neither of those precautions were necessary for our trip. As we were in bright daylight and in view of the public, I asked for and received permission to take a few photos. In the process of so doing, another guard approached rapidly yelling for me to stop and wanting the film from my camera. The person who originally OK'd my reconnaissance intervened and I was allowed to remain out of custody with my camera film intact. That was just as well because there was no one else available to fly their bomber wings out that day. As the loadmasters were busy closing up the nose of the airplane and securing our load, one of our APUs decided to blow a hydraulic line and dump some of the contents of the system onto the Boeing ramp. This got everyone quite excited. The folks at Boeing, being in a civilian organization under the auspices of the EPA and other government busybodies, were very concerned about a "hazardous fluid spill." Now I've seen my share of hydraulic spills from the C-5 over the years and this one was relatively modest and quickly handled by a few shovelfuls of oil dry onto the offending puddle. In between snide comments by the Boeing personnel questioning the parentage of Lockheed design engineers, the spill was cleaned up and the leak was secured. Other than being somewhat bulky, the wings didn't weigh much so our airplane was rather lightly loaded. The flight from Seattle to Palmdale is only a few hours so the fuel load was light as well. The leg was mine and Fred (the C-5) was just as anxious as we were to depart and quickly leapt into the sky. After an uneventful flight to Palmdale we were ready to unload our precious cargo and enjoy another tour, this time of the Northrop assembly plant. Many of the same security protocols were in place here but we were not permitted down onto the factory floor. Instead we got to observe from a raised catwalk. This factory did in fact look quite similar to any auto or aircraft assembly plant except that there were B-2 bombers in the line instead of 737s or cars. We did get to speak with one of the B-2 program test pilots whose name escapes me after the decades. This gentleman told us that he had also worked on the C-5 flight test program and relayed interesting factoids such as the B-2 having more wing area than that of the C-5. That was the end of our B-2 adventure but I wanted to relay one more bit of B-2 lore. 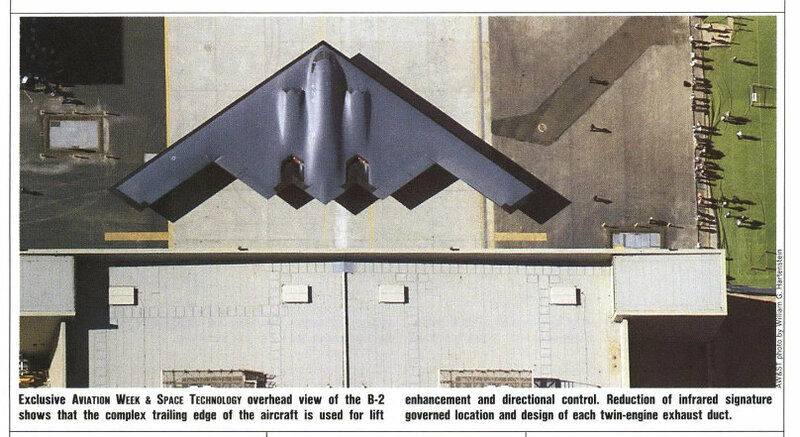 On that day back in 1988 when the B-2 was first rolled out of the Northrop plant for public viewing, the Air Force took extensive steps to ensure that the back of the airplane would not be publicly visible. Shielding the engine exhaust from radar was considered a difficult problem to solve and the intent was apparently to conceal the exact design. An enterprising editor at Aviation Week magazine named Mike Dornheim noted, however, that the Air Force had neglected to close the airspace over Palmdale that day. Dornheim rented a Cessna and along with a photographer got complete photos of the entire B-2 which were featured prominently in the magazine the following week. But one has to question the need for all the secrecy, as it was later noted that the stylized star design painted on the ramp for that occasion was actually made using silhouettes of the bomber. Being a young (private) pilot at the time, worried mostly about completing my dissertation in molecular biology, I wondered at the technology af this aircraft and the way it came to be. Thanks for an "inside" accounting of it all. Wow...molecular biology. Do you fly now? And what sort of work do you do in biology? Haven't flown for a while but did go back and got my instrument rating and enjoyed flying a 182 turbo that a friend owned. As for job, I work for an evil pharmaceutical company that keeps delivering new medications that save people's lives but, for some reason, that they don't want to pay for. Go figure. Actually, I'm very proud of all the lives I've positively impacted by developing drugs - despite hearing raving lunatics rant about how evil we are while sitting next to them on the plane. I'm betting you can relate a bit to that. BTW - my brother taught me to fly; he was a professor at Purdue in AvTech. He flew for Braniff at one point but didn't like the lifestyle. Braniff was some gig while it lasted.